Alfalfa seed harvest requires combine settings for adequate threshing while avoiding mechanical damage. The author is the vice president of North American sales for S&W Seed Company. Breeder seed is early-generation seed produced from a polycross of multiple parent plants, creating an experimental cultivar. Breeder seed production is typically done in a greenhouse and in small outdoor caged plots with captive pollinators to exclude outside alfalfa pollen. A portion of breeder seed is used for small plot forage trials and characterization that includes testing for disease and pest resistance. The rest can be kept in controlled storage until needed to grow later generations of foundation and commercial seed production, if the experimental cultivar performs well enough in forage trials for advancement to commercial status. Foundation seed production is a crucial step on the path to commercial seed production. Foundation seed fields are typically 2 to 5 acres. Breeder seed is planted in 30-inch rows at low rates of 1/2 to 1 pound per acre, maximizing foundation seed production from just a few pounds of breeder seed that will need to last for the commercial life cycle of a cultivar. Breeder seed is often pelletized with a coating so that seed can be singulated for uniform spacing within the row. Bee boards are placed in alfalfa seed fields. Boards can be wood or Styrofoam, with 3/8-inch holes for leafcutter bees to nest in. Combine cleanout is equally important before harvesting a foundation seed field. Combines are typically blown down with compressed air inside and out. Every nook and cranny needs to be free of seed before harvesting a new foundation seed field, so as to maintain genetic integrity of each cultivar. The same goes for maintaining genetic purity during the seed cleaning and conditioning process for foundation seed. Commercial seed production is the next major step, planting larger commercial seed production acreage from foundation seed. Most seed production is in the arid West for efficient and consistent yield of high-quality alfalfa seed. With no appreciable summer rainfall, seed growers can manage the timing and level of moisture stress needed to produce a seed crop instead of a forage crop. Leafcutters are solitary bees that gather alfalfa pollen as food for developing larvae. 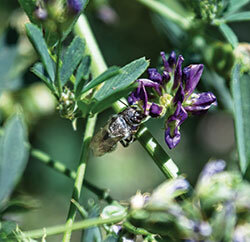 They are efficient pollinators for alfalfa seed production. Commercial seed fields range in size from small to large. The preferred establishment time is late summer, allowing for good stand establishment and full seed production the following year. Only 60 to 80 percent of full seed yield is attainable if the fields are spring planted. Here again, 30-inch rows are the norm for commercial seed production. The seeding rate is 1 to 2 pounds per acre of raw seed. Alfalfa is an indeterminate flowering plant. Buds and flowers develop sequentially over a period of weeks as stems continue to elongate. Pollination and seed set occur over a period of two to three weeks with seed maturing first in lower pods. Wider rows help reduce humidity within the canopy to avoid quality loss of early maturing pods, thus maintaining recoverable seed yield of early-set seed while later pods continue to mature further up the stem. Some California nondormant commercial seed is produced in solid stands where seed growers take one or two cuttings of hay in the spring, followed by seed production in the hot summer months, then back to hay production after seed harvest. However, most dormant seed production in the Northwest is planted like a row crop, since the goal is not forage production, but rather to maximize the yield of quality seed. Planting like a row crop allows equipment to pass through fields with less damage to plants when controlling weeds and insect pests. Weed control is important to minimize weed seed. Pest control is especially critical during and after seed set through seed maturity. Insect pest control must be done in a way that avoids killing pollinators while late emerging flowers are still being pollinated. Lygus bugs are the most widespread insect pest, ruining immature seeds with their piercing-sucking mouthparts. Like many other agricultural products, the U.S. is a net exporter of alfalfa seed to countries all around the world where alfalfa is grown. Seed growers have a special skill and check their fields often since seed production requires a lot of management and work. Seed production grown for export usually requires field inspection depending on the destination country. Seed production agronomists, seed certifying agency personnel, and phytosanitary inspectors are some of the people who also check alfalfa seed fields during the growing season. The next article in our series will cover conditioning, treatment, and packaging, as alfalfa seed makes its way to your seed dealer. Because alfalfa is primarily self-incompatible, pollinating insects are needed for cross-pollination among plants in order to obtain a seed crop. Leafcutter bees are the preferred pollinator because they seek pollen and stay close to their domicile within the field where they are placed. Their cost is about $400 per acre at current bee prices and recovery rates in the Northwest. Alkali bees are a native ground-nesting species that can be encouraged through cultural management of sodic soil areas near seed production fields and can help seed producers defray costs of purchasing leafcutter bees. Honeybees are less expensive and less efficient pollinators than leafcutter bees. Honeybees seek primarily nectar and they try to avoid the slap in the face delivered by an alfalfa flower when it “trips” to splash pollen on visiting insects. Honeybees can fly several miles in search of nectar from other flowering plants. Whether intentionally placed as pollinators, or just backyard bees, honeybees are almost always present and can spread small amounts of alfalfa pollen between seed production fields, even with good isolation. This aspect of pollen travel makes it difficult to completely avoid low-level cross-pollination between seed fields grown under accepted certification standards for field isolation. Seed companies often seek greater isolation distances of 2 miles or more in order to produce seed that meets a nondetect standard for genetically modified (GM) traits. Some seed companies use similar rigorous isolation standards for growing foundation seed. Low-level presence of a GM trait in foundation seed will render subsequent commercial seed production unacceptable for most seed exports and for planting seed in fields where hay production is destined for sensitive markets. This article appeared in the February 2017 issue of Hay & Forage Grower on pages 22 and 23.